Stereotactic body radiotherapy (SBRT) for non-small-cell lung cancer (NSCLC) has led to promising local control and overall survival for fractionation schemes with increasingly high fractional doses. A point has however been reached where the number of fractions used might be too low to allow efficient local inter-fraction reoxygenation of the hypoxic cells residing in the tumour. It was therefore the purpose of this study to investigate the impact of hypoxia and extreme hypofractionation on the tumour control probability (TCP) from SBRT. A three-dimensional model of tumour oxygenation able to simulate oxygenation changes on the microscale was used. The TCP was determined for clinically relevant SBRT fractionation schedules of 1, 3 and 5 fractions assuming either static tumour oxygenation or that the oxygenation changes locally between fractions due to fast reoxygenation of acute hypoxia without an overall reduction in chronic hypoxia. For the schedules applying three or five fractions the doses required to achieve satisfying levels of TCP were considerably lower when local oxygenation changes were assumed compared to the case of static oxygenation; a decrease in D50 of 17.7 Gy was observed for a five-fractions schedule applied to a 20% hypoxic tumour when fast reoxygenation was modelled. Assuming local oxygenation changes, the total doses required for a tumor control probability of 50% were of similar size for one, three and five fractions. Although attractive from a practical point of view, extreme hypofractionation using just one single fraction may result in impaired local control of hypoxic tumours, as it eliminates the possibility for any kind of reoxygenation. The use of stereotactic body radiation therapy (SBRT) has continuously grown and proven highly successful in the treatment of lung cancer[1–9] since the first treatments of extra-cranial malignancies employing few high-dose fractions performed by Blomgren and Lax in the 1990s[1, 2]. As treatments delivered in fewer fractions are more advantageous from both economical and practical points of view, there is a tendency towards extreme hypofractionation in SBRT. The high precision allowed by the use of a stereotactic frame to fixate the patient or, more recently, image-guided frameless techniques has enabled an escalation of the fractional dose. However, the impact of extreme hypofractionation on the treatment outcome must also be evaluated from a radiobiological point of view as such schedules may pose a challenge to the radiobiological rationale behind fractionation summarized by the so-called 5 R’s of radiobiology. A reduced number of fractions implies a shorter treatment time, but also requires a higher dose per fraction to achieve the same effect. Therefore, the impact of redistribution and repopulation can be neglected as the high doses will most likely cause cell cycle arrest and accelerated repopulation does not usually occur until after about four weeks of conventional radiotherapy. Furthermore, due to the high dose rates of today’s modern accelerators, repair during delivery will also be negligible. Particular attention might be required for the hypoxic cells that are more likely to survive irradiation due to their increased radioresistance compared to well-oxygenated cells. For conventional fractionation, reoxygenation of hypoxic tumour cells during therapy is considered a crucial process as some of the hypoxic cells are assumed to become oxic between fractions and thus radiosensitized at the next fraction[14, 15]. Although no improvement in the global oxygenation status through tumour shrinkage could be expected during a short SBRT treatment course, experimentally observed inter-fraction local changes in oxygenation might benefit the treatment outcome. The reduced possibility of these local changes implied by a considerably reduced number of fractions might however compromise the treatment outcome for patients with hypoxic tumours. The oxygenation, together with the related radiosensitivity of a tissue, should thus be considered in evaluating the impact of extreme hypofractionation. Previous studies on this topic by Ruggieri et al. and Carlson et al. led to seemingly conflicting conclusions on how SBRT-like treatment schemes impact upon the treatment outcome in hypoxic tumours. The present study adds to the previous work and aims to bring further arguments that may clarify the impact of hypoxia on tumour control probability (TCP) when the dose is delivered in very few, large fractions. where α and β are the radiosensitivity parameters for oxic conditions. The values of α and β used in all calculations were 0.33 Gy-1 and 0.038 Gy-2 respectively (α/β = 8.6 Gy), in accordance with the values reported by Park et al. (2008) for NSCLC. where Dq is the dose at which the tangent of the final slope D0 of the survival curve intercepts the horizontal axis at 100% survival and DT is the threshold dose at which the LQ model transitions into the SHMT model. Values of D0, Dq and DT for NSCLC were 1.25 Gy, 1.8 Gy and 6.2 Gy respectively. where OMFmax is the maximum relative resistance achieved in the absence of oxygen corresponding to an oxygen enhancement ratio (OER) of 3 and k is a reaction constant around 2.5-3 mmHg. A value of k = 2.5 mmHg was used in the current simulations. The three-dimensional tumour oxygenation was modelled based on biologically relevant inter-vessel distance (IVD) distributions derived from the experimental work by Konerding et al. (1999). By defining well-oxygenated and hypoxic regions and assigning IVD distributions with different average values to these regions, in silico tumours with different levels of hypoxic fraction (HF) were constructed based on the diffusion and consumption of oxygen. Two different oxygen distributions were considered for the 20 mm tumour in this study: a 13 mm hypoxic core resulting in an overall hypoxic fraction less than 5 mmHg (HF) of about 20% (corresponding to 64% hypoxia within the core) and an oxic tumour with less than 1% hypoxia heterogeneously distributed. Examples of cross-sections through these tumours and the corresponding oxygen partial pressure histograms are shown in Figure 1. Simulated tumours and their oxygenation. 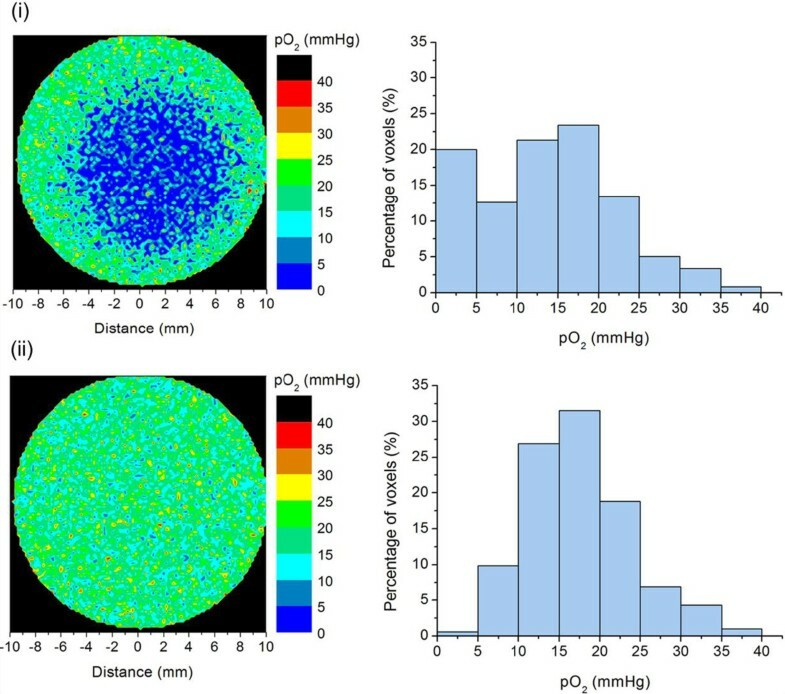 Two-dimensional p O2-maps of cross-sections through the simulated tumours and the p O2-histograms of the oxygen tension values for the whole (3D) tumours. i) Hypoxic tumour with a 13 mm hypoxic core, overall HF ≈ 20%, core HF ≈ 64%, ii) Oxic tumour with an overall HF < 1%. Acute hypoxia is associated with local changes in perfusion, which might take place between two consecutive SBRT fractions. In order to investigate the impact of the resulting local oxygenation changes (LOC) on tumour control, the values of the oxygen tension were randomly locally redistributed at each fraction by randomly closing a fraction of the simulated vessels. For comparison, the case of static oxygenation was also investigated, by keeping the oxygen distribution the same in all fractions. No substantial improvement of overall tumour oxygenation associated with the slow reoxygenation of chronically hypoxic regions was simulated, because of the short overall treatment time in the SBRT treatment schedules considered for this study. For comparison with clinical data the irradiation of the modelled tumour with 20% overall hypoxic fraction (Figure 1i) was simulated using fractionated schedules currently employed in the clinic for the SBRT treatment of NSCLC[1–9] together with clinical prescription coverage of the planning target volume (PTV). The explicit number of fractions and the corresponding dose per fraction as well as the dose prescription planning details are given in Table 1. The diameter of the PTV was assumed to be 40 mm, corresponding to a clinical target volume (CTV) of 20 mm with an additional 10 mm margin. Using a clinically relevant dose distribution (Figure 2) the prescription details of the reported treatment schemes given in Table 1 were fulfilled in terms of dose escalation, dose to the PTV periphery and maximum dose. aBased on doses 19–30 Gy to isocenter: 19 Gy (1 patient), 22 Gy (2), 24 Gy (7), 26 Gy (14), 28 Gy (10), 30 Gy (30). cDose range 24–40 Gy, 69% was given 37.5 Gy, (2 patients had doses prescribed to 80% isodose). dDoses prescribed to 60-90% isodose (median 84%), overall survival expressed as operable/inoperable patients and including other dose schemes. eBased on 60 Gy total doses given in 3, 5 and 8 fractions: 3 × 20 Gy (33%), 5 × 12 Gy (50%), 8 × 7.5 Gy (17%). Dose distribution for the simulation of SBRT treatments. 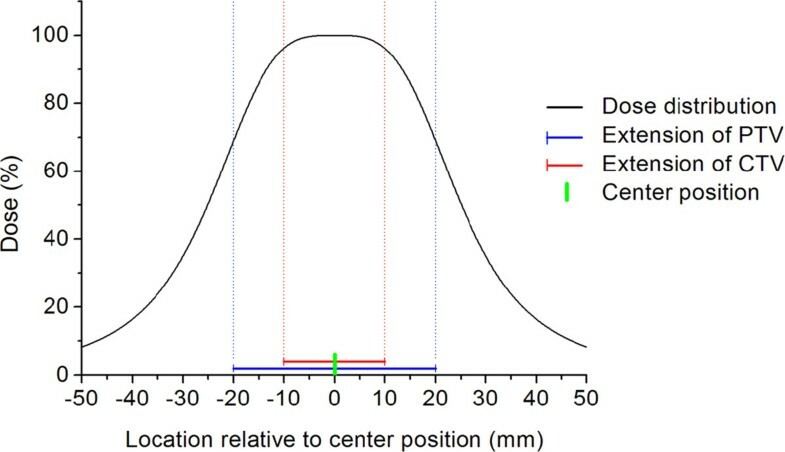 The clinically relevant dose distribution normalized to the maximum dose so that the percentage dose at the PTV periphery (20 mm from the centre) is 69% and the maximum dose is 100%. The extents of the CTV and PTV are marked with red and blue lines respectively. In addition to the fractionation schemes clinically used, schedules in which the treatment is delivered in one, three or five fractions were employed for the modelled tumour types (Figure 1). For both cases, the clinically relevant dose distribution illustrated in Figure 2 was used with the fractional dose prescribed to the 69% isodose encompassing the PTV for the two tumour types considered. Prescription to the 69% isodose was chosen as representative of the current SBRT practice[1–9]. where n is the number of fractions, Nvox is the total number of voxels, N i is the number of cells in each voxel i and d i , p O2 i,j and SF(d i , p O2 i,j), is the dose, the oxygen tension and the cell survival in voxel i at fraction j. By randomly re-distributing the p O2-values between voxels at each fraction, experimentally observed local variations in oxygenation between fractions were simulated[19–21, 28]. In the current study the total number of clonogenic cells in the tumour was set to 108. 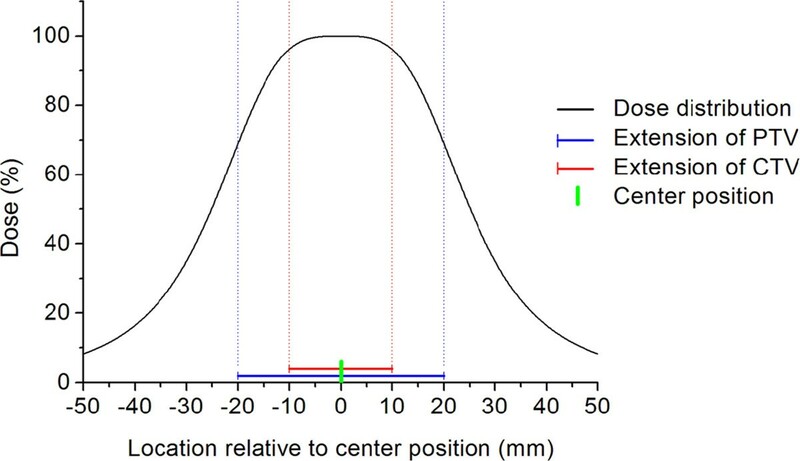 D50 is the total dose required for a tumour control probability of 50% and γ is the slope of the curve at 50% TCP, similar to the clinical fit of dose–response curves. The TCP values for the 20% hypoxic tumour (Figure 1i) calculated using the clinical dose prescription schemes are presented in Table 1 together with the reported clinical outcome. For single-fraction schedules, there is a large difference between the predicted TCP and the clinically observed values of local control. For multifraction schemes, a trend of better agreement between clinical outcome and simulations assuming LOC compared to the case assuming static oxygenation was observed. For most of the schedules the choice of survival model between LQ and USC seems to have little, if any, impact on the outcome in terms of TCP. Figure 3i and ii show the TCP curves obtained for the clinically-relevant theoretical schedules of different fractionations when either the linear-quadratic or the universal survival curve model was used to calculate the surviving fraction in the hypoxic (HF ≈ 20%) and the oxic (HF < 1%) tumours (Figures 1i and ii). In Table 2 summarizing the D50 values, it can be observed that the D50 increases as the number of fractions is increased. However, the increase is not as large as might have been expected from performing a simple calculation of the corresponding equivalent isoeffective dose using a typical biological effective dose (BED) conversion[22, 30]. The impact of increasing the number of fractions is more pronounced for static oxygenation. For example in Figure 3i, the curves representing 1, 3 and 5 fractions (labelled "no LOC, LQ") lead to D50 values of 31.0, 46.0 and 53.9 Gy respectively. Assuming LOC, the 7.9 Gy difference in D50 between 3 and 5 fractions is reduced to only 0.6 Gy (35.6 Gy vs. 36.2 Gy for 3 and 5 fractions respectively). Furthermore, the difference in D50 between one and five fractions is only 5.2 Gy, (D50 = 31.0 Gy for one fraction and 36.2 Gy for five fractions assuming LOC). TCP curves using the LQ and USC models. TCP curves for a tumour with i) 20% overall hypoxic fraction located centrally and ii) 1% hypoxic fraction, heterogeneously distributed, with and without inter-fraction LOC calculated with the linear-quadratic model and the universal survival curve as a function of total dose prescribed to the PTV-encompassing 69% isodose. A certain level of TCP requires higher doses with the USC than with the LQ model, in accordance with the predicted over-estimation of clonogenic cell killing by the LQ model. For single fraction doses, the difference between the LQ- and USC-curves is quite large. For three and five fractions however, the difference between using either of the two models seems to be negligible, the two curves for 5 fractions being visually indistinguishable for both tumour types assuming LOC. Noticeable in Figure 3i and ii is the smaller range of D50 for the TCP curves obtained with USC model (thick curves) compared to the curves obtained with the LQ model (thin curves). This reflects the lower fractionation-sensitivity of the USC model at high fractional doses. An interesting feature of the curves in Figure 3i is that for a given level of TCP, the single-fraction curve obtained with the USC model predicts a higher total dose than some of the curves representing three and five fractions. Although this might seem counterintuitive, it is a consequence of the way the universal survival curve model is constructed. At doses per fraction above the transition dose DT, the universal survival curve predicts a difference in survival compared to the LQ model that increases with increasing dose. 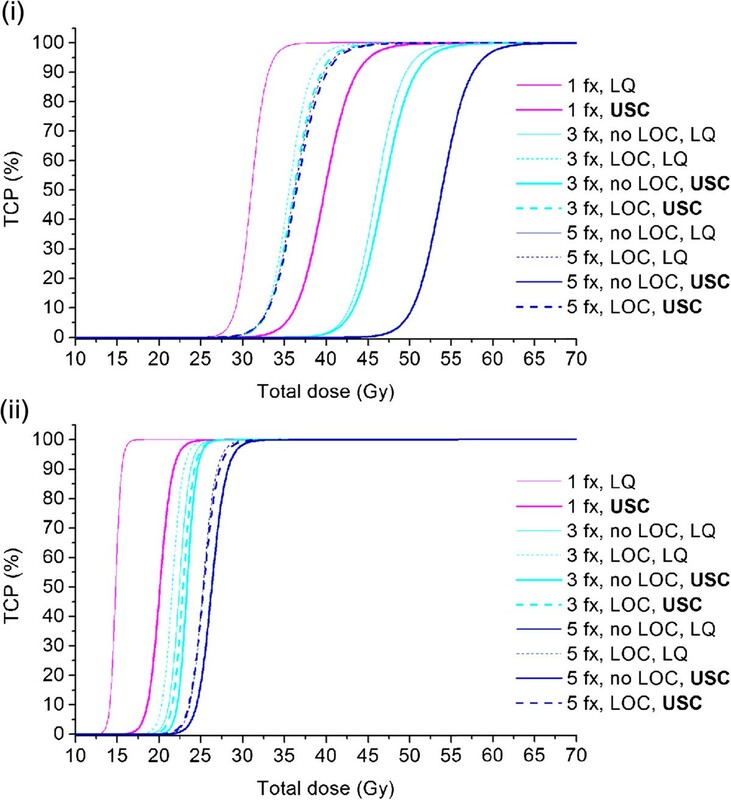 For the high doses required in single-fraction treatments, the difference is most pronounced, as reflected by the large difference in D50 between the single-fraction TCP-curves obtained with the LQ and USC models in Figure 3i. For a total dose delivered in three or five fractions, the fractional dose is much closer to the transition dose and the predicted survival is thus higher. Hypoxia is a common feature of solid tumours that is considered responsible for the failure of many treatment approaches. It has been shown to affect non-small cell lung cancer (NSCLC) tumours, where more than 80% of the investigated patients had a fractional hypoxic volume (FHV) over 20% and the median FHV was 47.6%. Reoxygenation of tumours is thought to be an effective way to increase local control and it represents one of the radiobiological rationales for conventionally-fractionated radiotherapy. However, the impact of inter-fraction local oxygenation changes for extremely hypofractionated SBRT employing high doses per fraction has not been fully investigated. SBRT treatments are usually very short and therefore they do not allow enough time for the global reoxygenation that results from tumour shrinkage in longer treatments. Fluctuations of acute hypoxia on the microscale, as described by Ljungkvist et al. thus remain the main mechanism that could change tumour oxygenation for extremely fractionated schedules. The outcome of the present study suggests that inter-fraction LOC is a process that could strongly modify the response of hypoxic tumours, possibly explaining the current success of SBRT in treating hypoxic tumours. The results for the clinical multifraction schedules presented in Table 1 indicate a trend of better agreement between local control and the calculated TCP values assuming LOC, as opposed to the case of static oxygenation. This could indicate that local oxygenation changes might take place between fractions in clinical SBRT patients. As no information of the oxygenation or number of clonogenic cells is available for the tumours included in the clinical studies, a direct comparison between calculated values and the reported local control is difficult to make. For the single fraction schemes, the difference between the observed local control and the calculated values of TCP is large. This could be explained by the limited knowledge of tumour response to the high doses delivered in single-fraction treatments. It has been hypothesized that there might be processes leading to increased cell death only taking place at these high doses such as vascular damage. As such effects are not included in the present modelling, they could be one of the reasons for the observed discrepancies. The dose–response curves and corresponding values of D50 (Table 2) show that a great decrease in dose per fraction can be expected if LOC is assumed, the total doses for three and five fractions being almost equally low. This offers an interesting point of view for the issue of fractionation for stereotactic treatments. While extremely hypofractionated schedules may not be preferred from the point of view of the conventional fractionations where the focus is on the differential between tumour response and normal tissue damage, they might provide an advantage for stereotactic treatments that are based on the limiting of the ‘red shell’, the high-risk zone of normal tissues receiving therapeutic doses. Thus, shorter schedules might appeal both to patients that would have to go through fewer treatment sessions and for the radiotherapy departments as they will free valuable accelerator time that could in turn be used to increase patient throughput. Nevertheless, this would apply only if LOC take place during the treatment, as otherwise much higher doses would be needed to achieve the same control rates. The simulations in the present study have been performed using both the LQ model and the universal survival curve (USC) model which is an empirical extension of the LQ model. The suitability of the LQ model for high doses has been intensely debated in recent years focusing on the possibility of overestimating cell kill at high doses like those used in SBRT. This has led to the development of the universal survival curve model which is thought to better fit the experimental data in the high-dose range, although the mathematical framework and the lack of mechanistic basis of the model has been criticized. The results of the current work indicate that for multifraction schedules the difference in terms of the calculated TCP between using either the LQ or USC formalism is not considerable. The present study adds to the results of two previous studies based on the LQ formalism[17, 18]. Indeed, comparing the results in Figure 3i and ii and Table 2, it can be seen that tumours with increased hypoxia would require higher radiation doses to achieve a high TCP, especially in the absence of inter-fraction LOC, which is in agreement with the proposal of Carlson and colleagues. Ruggieri and colleagues argued that intra-tumour simultaneous dose-boosting is capable to counteract hypoxic radioresistance. This statement is not in contradiction with the results of Carlson et al. or with the results of the present simulations. Indeed, dose escalations towards the centre of the tumour will increase cell kill and therefore lead to better tumour control compared to homogeneous dose distributions, especially if the hypoxic areas are centrally located. However for non-gated treatments, the tumour movement relative to the treatment beams could bring the tumour towards the lower dose regions at the margin of the PTV, which could in turn lead to a shift of the dose response curve to higher doses. Nevertheless, choosing suitable PTV-to-CTV margins might minimize the impact of this factor and the expected differences will be small. The results of this study illustrate the interplay that could be expected between total dose, fractionation, hypoxia, and the dynamics of oxygenation for SBRT treatments. They suggest that extreme hypofractionation, as low as one single dose fraction, should be pursued with caution so that the current success of SBRT should not be jeopardized. The first author (Emely Lindblom) was partially financially supported from the Cancer Research Funds of Radiumhemmet which is gratefully acknowledged. All authors have been involved in the study and the manuscript. EL participated in the design of the study, the theoretical modelling and simulations, the analysis and interpretation of data and drafted the manuscript, LA participated in the analysis and interpretation of data and reviewing the manuscript, AD provided the basic software for the theoretical simulations, IL participated in the design of the study, interpretation of data and reviewing the manuscript, PW participated in the interpretation of data and reviewing the manuscript and IT-D coordinated the design of the study, analysis and interpretation of data. All authors read and approved the manuscript.